There's something deeply satisfying about this screenshot. 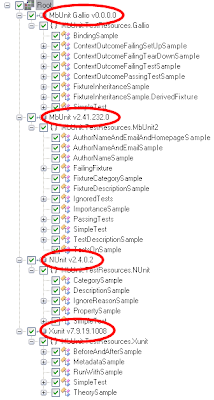 Here we can see MbUnit v3, MbUnit v2, NUnit and xUnit.Net all side-by-side in the same test runner. Not bad. Edit: I just noticed that I mislabeled the xUnit.Net framework in there. It should be using the official name of the project rather than Xunit. That's fixed now.